"After using a commercial printer for nearly 20 years, we at Laughing Moon decided to make a change. Although the old printing process had advantages, after looking at both the plus and minus sides of ‘old way’ versus ‘in house‘, the decision to print in house easily was the best choice. The following is an explanation of the reasons for the change. Light weight tissue paper for the patterns. Because the paper was so thin, the packages were relatively small. There was a certain economy of scale as the commercial printers could print a large number of patterns very economically. There was a weight advantage using tissue paper patterns. Many customers do not like the flimsy tissue paper and prefer a light bond for durability and ease of use. The tissue paper ripped easily even with light handling and was not suitable for multiple use. The old printing process had technology problems and was not keeping up with improvements. Color was not possible, for instance, on anything but the envelopes. The old printing process used heavy low quality newsprint for the instructions. The instructions now are printed on white bond. There are no longer any restrictions on how the instructions must be formatted. They can now be any size or color. The patterns are now printed on white bond. The printing is crisp and exact rather than the brown tissue which often was light in places and sometimes smeared. Gray shading and color create crisp clear images and photos. The old black and white printing lacked definition, and was similar to a low quality fax or a black and white printer. Photos and complicated images were reduced to black and white blobs. The multiple lines on the pattern pieces which delineate the grading of different sizes can now be printed in colors. This makes it very clear on which line to cut, which reduces confusion and makes multiple size patterns very easy to use. The old paper pattern envelopes were flimsy and tore easily. They were, in fact, too small to contain the pattern again once it had been unfolded. The new high quality plastic zipper bag can not only easily contain the pattern and instructions once they are unfolded, it is also water resistant (nearly water proof), and provides more protection to the contents. The pieces of the pattern are much more likely to stay together and in reusable shape in the new bag. All you need to appreciate this is to have your shipping carrier deliver a sopping wet box of patterns, all of which are completely unusable (interminable insurance problems ensue). The old paper envelopes were easily damaged, becoming shop worn or damaged just by the shipping process. The new bag keeps the contents crisp and clean. The new inks will not smear or fade and are guaranteed for 100 years. With the high quality paper and high tech inks the pattern can be ironed without damage. This is important because some people like to iron the creases out of the pattern pieces so they will lie completely flat. The process of ironing tissue paper usually involved tearing or creating more creases than you were flattening out. The fronts of the patterns are printed on a glossy, high quality paper that presents an eye-catching and professional image. The images are bigger and better than were possible on the old pattern envelopes. We always use photos of the real garments made from the pattern. We have had customers tell us over and over again how much they appreciate that. 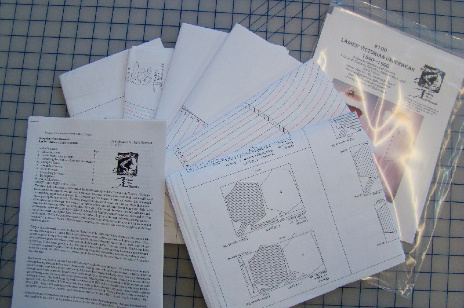 Many independent patternmakers provide amateurish sketches or highly idealized images on their pattern envelopes which do not realistically or completely depict the garment patterns contained therein. Not only do we have photos on the front, but we also have flat illustrations on the back which show the different styles of garments that can be made from the same pattern. We also show front and back, which is generally missing in other patterns. The larger format allows us to provide more and better information about the pattern on the outside. We will be able to react immediately to any errors or omissions. We hope our patterns are perfect when we publish them. However, sometimes errors occur. Since our patterns are no longer printed in huge quantities, we can correct any errors and add any omissions immediately, greatly improving our responsiveness to our customers.